Is Getting Rid of Performance Reviews Really a Good Thing? What’s more, the improvements in measures of employee performance that companies expect actually fall because managers struggle to make and communicate performance and pay decisions without ratings. In fact, less than 5% of managers are able to effectively manage employees without ratings. CEB analysis shows that eliminating ratings leads to four unintended outcomes. Manager conversation quality declines by 14% because managers struggle to explain to employees how they performed in the past and what steps to take to improve future performance. Managers have more time, but time spent on informal conversations decreases by 10 hours because managers do not shift that extra time toward ongoing, informal performance conversations. Top performers’ satisfaction with pay differentiation decreases by 8% because managers have trouble explaining how pay decisions are made and linked to individual contributions. Employee engagement drops by 6% because managers are unable to do the very things that are proven to engage employees, such as set expectations for their, hold clear performance and development conversations, and provide appropriate rewards and recognition. In sum, the theory of removing the annual review process is that more frequent, informal feedback could be more effective than an annual "event" at which managers employ a formal ratings system to evaluate and rank employees. In reality, it appears that many managers simply do not provide sufficient feedback when formal annual review systems are eliminated. Perhaps we should not be surprised by these findings. Many managers would rather jump in the water off the Maine coast in January than deliver feedback to their subordinates! What People Really Mean at Meetings! I'm very excited about the innovations in teaching and learning taking place on our campus at Bryant University and looking forward to the opening of our new Academic Innovation Center later this summer. 1. Take the opportunity to communicate the core values on many occasions in many different arenas. Communicate those values simply and consistently. 2. Recognize and reward those people whose extraordinary efforts embodied those values and made the organization better as a result, even when they could have taken an easier road perhaps with better short term results. 3. Be consistent. Make sure that top leaders act in a way that is consistent with the values that they articulate. They can't just espouse certain values; they must back it up with action. 4. Engage your employees in an ongoing discussion of the merits of these values. Why do they matter? How do these values manifest themselves in day-to-day work? Don't just talk at them. Create a conversation with them about those values. 5. Create case studies of situations in which the organization may have strayed from those values. Talk candidly about what the negative consequences were, and discuss the lessons learned from that experience. Focus on learning, not on blame. What Do Job Seekers Want? 1. Culture: Burgess writes, "More than two-thirds (66%) of survey respondents wanted to know about a company’s culture and values above all else when considering changing jobs." 2. Big-Ticket Benefits: Burgess writes, "Our research suggests that job seekers will pass on smaller luxuries in favor of familiar items that have a bigger impact on quality of life. Just over three-quarters of U.S. workers prefer great health care packages over schedule flexibility and remote working, parental leave, free food, onsite daycare, gym memberships, or allowing pets in the office." 3. The Company's Mission: Burgess writes, "Job seekers in our survey care quite a bit about prospective employers' missions but want to know how they make them a reality." In this month's issue of Harvard Business Review, we read about fascinating new research by Jeffrey Cohn, of the executive search firm DHR International, and J.P Flaum, of the consulting firm Green Peak Partners. They have studied the CEO hiring practices and philosophies of 32 private equity firms. Why examine these companies' selection processes for bringing new CEOs on board? Cohn and Flaum argue that these firms are different than most publicly traded companies, because the private equity partners have far more skin in the game than the board members of most public firms. Thus, the private equity partners worry a great deal about getting the hiring decision wrong. You need to be careful about the conclusions you draw in this case. I don't think private equity firms believe that experience does not matter. They have concluded that experience is overrated. I think that is probably true in many circumstances. Why? As the excerpt above states, past success may not simply be a function of individual skill. It may have to do with "right place/right time" as well as a series of organizational and team factors that contributed to high performance. Moreover, I would argue that experience can be a curse as well as a blessing in many situations. Successful people do get trapped into believing that they have discovered a "formula" for managing that can be applied in all future situations. Years ago, Chuck Knight, the former CEO of Emerson Electric, visited my class. He had retired after several decades at Emerson, during which time the firm enjoyed remarkable success. A student asked him, "Mr. Knight, if you were asked to lead a Silicon Valley firm today, would you apply the highly celebrated Emerson strategic planning process that you employed with much success for years?" He replied, "I probably would try, and I probably would fail... and so, I'll stay retired." Everyone laughed. However, he made the powerful point that it would be so enticing to try to apply his winning formula in that new job, but the context would be so different. That same formula would not be ideal in that new circumstance. However, most leaders has a tendency to rely too heavily on what worked for them in the past. That's the potential curse of experience. Fast Company has published an article this week titled, "How to Brainstorm Like a Googler." The author is Veronique Lafargue, global head of content strategy at Google Apps for Work. In many ways, the title ought to be, "How Google Employs IDEO's Design Thinking Process." The article highlights the three broad phases of design thinking: understanding and empathizing with the users, brainstorming, and prototyping. The video below shows you a bit more about how this process works at Google. The article has a couple of helpful tips and reminders for those engaged in brainstorming in their own organizations. First, Google practices 10X thinking when they brainstorm. "The notion of "10x thinking" is pretty familiar in the business world by now, and it's at the heart of how we innovate at Google. It's about trying to improve something by 10 times rather than by 10%. One example is Project Loon, our initiative for providing internet access to everyone: An incremental solution would be to just install more fibers, whereas a "10x" idea is Project Loon—a network of balloons traveling on the edge of space, designed to connect people in rural and remote areas and help fill the hardest-to-reach gaps in coverage." Second, Google encourages people to try to state their ideas as concisely and crisply as possible. Google talks about writing headlines. "Being able to describe an idea in less than six words helps you clarify it. Imagine your favorite media outlet or magazine covers your great idea: What would you want the headline to read?" Third, don't wait to prototype. Move quickly from brainstorming to prototyping. Most brainstorming sessions end with an agreement to have another meeting later, to take those ideas and work them up further. It's a common mistake. You want to strike when the iron is hot—you don't want to walk away or agree to follow talk with more talk. Here at Google, we like to build a quick prototype pretty much right away. A large part of your job is to drive innovation...It really comes down to this thought: Permission granted. Having seen so many change situations in my career, change often starts with ourselves. Every company has people who don’t want to change the way things have been done. But often people are looking for an alibi to not try something new. And maybe people themselves aren’t willing to do what’s required to make the change. So the message I try to convey is, you have the permission to try something new. Another way to think of it is don’t wait for the invitation. There are a lot of opportunities to grab. If you see a better way, you have an obligation to do it. Venture Capital Investments that Suppress Innovation? Rory McDonald, Emily Cox Pahnke, Benjamin Hallen, and Dan Wang have written a new paper titled, "Exposed: Venture Capital, Competitor Ties, and Entrepreneurial Innovation." In this article, the scholars examine the impact on startups when venture capital firms invest in multiple firms in the same industry. The researchers argue that startups seek out venture capital investments for a variety of reasons, not simply access to funds. They also want the expertise, skills, and advice that venture capitalists have to offer, as well as access to a network of potential partners and customers that the VC firm can tap into for them. What happens though when venture capital firms invest in more than one firm in the same industry? Will their divided attention hurt the startups in which they invest? Will conflicts of interest damage innovation at the startups? In other words, might the venture capitalist end up picking favorites among the startups in which they have invested? To study these questions, the scholars examined roughly 200 firms working on medical devices related to minimally invasive surgery over a twenty year period. They identified which firms were working in the same market spaces, and they examined the venture capitalists investing in each of these firms. Ultimately, they tracked the new product introduction rate for each firm. What did they find? According to Harvard Business School's Working Knowledge website, "The data showed that companies tied to a competitor by at least one VC firm in common were indeed less innovative than those unencumbered by such ties; in fact, they were 30 percent less likely to introduce a new product in any given year." The scholars found some other impacts. According to HBS Working Knowledge, "The first was the level of “commitment” a VC had to a particular company, judged by the amount and frequency of funding. The same way a teacher may lavish more attention on a favorite student, the researchers found that VC firms also tended to pick favorites, which did better overall; their competitors were 55 percent less likely to introduce a product." Microsoft Acquires LinkedIn: Separate or Together? Acquisition double-talk, part 1: On the one hand, this deal is all about the oft-vaunted idea of “synergy” (even if that word is not used). The idea is presumably to build LinkedIn into all sorts of Microsoft products. Great! But, does this mean I’m going to get all sorts of messages suddenly asking if I want to share my Word doc through LinkedIn or have some LinkedIn integration with an Excel spreadsheet…or…what? There’s a lot of talk today about how this is going to broaden Microsoft’s reach into all sorts of new channels for selling stuff like cloud services. But does one of the largest tech companies in the world really need to spend $26 billion to reach new customers? O'Brien raises an interesting issue that arises in many acquisitions. On the one hand, the acquirer wishes to realize substantial synergies. After all, those synergies are the very reason why the acquirer pays a large premium to purchase the target firm. On the other hand, the acquirer does not want to spoil all that is good about the target firm. Thus, they promise to provide the target firm a great deal of autonomy moving forward. They promise to keep it separate. You can see the conundrum here. Keeping it separate means probably forgoing key synergy opportunities. Pressing for too many synergies too quickly might alienate employees at the target firm, infringe on the innovative culture of the target, etc. One also has to raise a broader question though: If you are going to manage the target separately, then could you have achieved many of the collaborative benefits without actually acquiring the firm. Could you have pursued some other organizational arrangement, such as a strategic alliance? Could you collaborate, but without the risks and costs associated with a merger? Professor Roger Anderson and I have published a new case study titled, "Belmont Abbey College: Strategy Formulation in Turbulent Times." The case is available from Ivey Business Cases and soon will be available through Harvard Business Publishing as well. The case study explores the strategic challenges facing small, private colleges with largely tuition-driven revenue models, with a focus on this particular Catholic institution in North Carolina. The case study is well-suited for courses in strategic management, as well as for those interested in issues about the future of higher education in the United States. Introducing The Food Truck Challenge! I am very excited to announce the launch of a new online experiential exercise that I have developed in collaboration with Harvard Business Publishing and Forio (the same partners with whom I collaborated on two prior simulations including the Everest Leadership and Team Simulation). 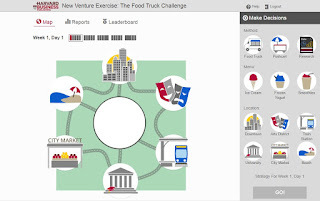 This new teaching tool is titled, New Venture Exercise: The Food Truck Challenge. Unlike my prior simulations, this exercise is designed to be run in just 30 minutes. Faculty members should be able to run the exercise and debrief it in a single class session. In this online exercise, students try to run a successful food truck in the city of Boomtown. Students work individually or in teams to achieve maximum revenue over 5 simulated weeks and win the "Food Truck Challenge." In each round, students make decisions about where to park and what menu item to offer in hopes of finding the best menu-location combination and yielding the highest sales. We believe that this exercise is well-suited for instructors teaching entrepreneurship, design thinking, new product development, innovation, and team/organizational learning topics and courses. I hope that many professors will take a look! Predicting Accurately: Focus on Outcomes First, Not the Details? Theresa F. Kelly and Joseph P. Simmons have published a new study in the Journal of Experimental Psychology regarding our ability to make accurate predictions. Kelly and Simmons conducted 19 experiments involving over 10,000 research subjects. They studied people's ability to predict the outcomes of 724 professional sports contests. Interestingly, they found that participants were less effective at predicting the outcomes of games if they also were trying to predict details about the contests (e.g. if they tried to predict the number of hits each team would get in a baseball game, while also trying to predict the final score of the game). We believe that this happens because having people predict the details of an event makes them think about additional information that is unimportant for predicting other related outcomes; however, once this information is made accessible in memory, people are more likely to use it in their forecasts, decreasing the weight given to more important information. This suggests that a relatively simple way to improve predictions could be to take a top-down approach and start by first predicting the most general outcomes and then letting those forecasts guide predictions of more detailed outcomes. Importantly, this prescription is not intuitive, as most decision-makers feel compelled to try to think through all of the available details about an event before making their forecasts (Lovallo & Kahneman, 2003). In this week's New York Times Corner Office column, Adam Bryant interviews Drew Houston, the CEO of Dropbox. Houston has some terrific advice for college graduates. I would argue that it's great advice for all of us, of any profession or stage of life. I did the commencement speech for M.I.T. in 2013. I said that if I had a cheat sheet that I could give myself at 22, it would have three things on it: a tennis ball, a circle and the number 30,000. The tennis ball is about finding the thing you’re obsessed with. The most successful people and successful entrepreneurs I know are all obsessed with solving a problem that really matters to them. I use the tennis ball for that idea because of my dog, who gets this crazy, obsessed look on her face when you throw the ball for her. The circle is really about the idea that you’re the average of your five closest friends, so make sure to put yourself in an environment that pulls the best out of you. And the last is the number 30,000. When I was 24, I came across this website that says most people live for about 30,000 days. So you have to make every day count. Several years ago, HBS Professor Amy Edmondson and I developed a simulation to teach about team decision making. The Everest Leadership and Team Simulation has become a common teaching tool at many business schools and executive education programs around the world. Interestingly, several scholars have used the simulation to study interesting questions about team dynamics. One such study was published recently in the Journal of Applied Psychology. The study, authored by Matthew Pearsall and Vijaya Venkataramani, examined teams of undergraduate business students as they tackled the simulation. The scholars wanted to explore the impact of team bonding and identification. Does coming together as a team and engaging in some team bonding have a big impact when tackling challenging tasks? After all, many organizations send teams off for bonding experiences of various kinds, thinking it will have a positive impact. Specifically, the scholars were interested in exploring teams where members also had strong personal goals, as well as a common goal that they were trying to achieve together. They recognized, as we did in developing our simulation, that balancing common and personal goals can be very challenging for many teams. A week later, the 28 teams in the high team identification group got a brief lecture about the importance of team commitment and identification for effective performance. They then competed in a contest to see which team could build a paper airplane that flew the farthest. They also were asked to create a team name and make a banner or flag for their team. Then all 56 teams participated in the Everest Leadership and Team Simulation that Amy and I developed. In the simulation, team members have some common goals and some personal goals that they would like to achieve. The inherent goal asymmetry means that you can't accomplish all the team and personal goals. Something has to give. The scholars examined how the different teams performed. They also assessed the teams once again after they had completed the simulation. What did they find? Interestingly, the "high identification" teams did not do better than the other teams in the control group. How about team learning orientation? Did being oriented toward learning about one another's goals and interests help drive performance? Yes, it had a positive effect, but not a large one. The best teams scored highly on both team identification and team learning orientation. You need both to succeed. Yes, you need to bond with your team members and feel a sense of belonging. However, that only helps if part of that bonding and identification process involves trying to truly understand the goals and interests of other team members. At the end of the day, personal interests matter. We succeed as a team if we can help individual members achieve their goals. We can't simply ask members to put aside all personal goals for the sake of the team. Performance Appraisals: Are "A" Players Always "A" Players? Cappelli: As far as we can tell, no one has ever looked at this before or at least published it. Are the people who do well always doing well, or not? If we know your scores this year for everybody in the company, how much of next year’s score could we predict or explain? If the good people are always good and the bad people are always bad, we can explain 100% of your scores because next year’s score will be identical to this year’s score. If it’s random, which would be kind of astonishing, then it would be zero. There’d be no relationship between how people on average perform this year and how they perform next year. The good people could be good, the bad people could be good or bad.